01 Sep 2013 How much will my roller bend under its load? Don’t try this at home – or on your production line. You have a 2m web with a load of 50kg (250N/m tension) wrapped around a roller in such a way that the full force of the web is pulling down on the roller. At the same time you have a 30kg nip load applied for reasons best known to yourself. And of course gravity is also pulling down from the roller’s own weight. Because you want to save money you’ve bought a cheap steel roller: it’s 100mmOD and 80mmID so its shell is 10mm thick. How much will the roll bend under that combined load and is that bend a worry to you? Roller bending calculations are straightforward and use standard formulae, but experience shows that most of us have great difficulty getting the calculations right – especially when the loads are applied at angles other than straight down. 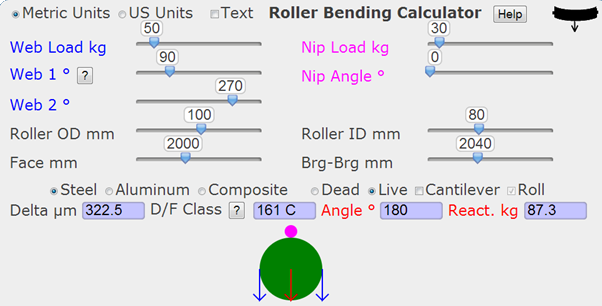 That’s why the Roller Bending Calculator exists: to do the hard work for you. It tells you that it bends downwards by 322µm and that its Deflection/Face_Length, D/F, is 161 which, according to Dr David Roisum who suggested this calculation, makes it a Class C situation, good only for tissues and non-wovens. If this was a high-quality application you would need much less deflection to avoid distorting the web. Using the app it is easy to find that a 120mm OD with the same ID will give 130µm bending which, over 2m, is Class A and won’t upset the web. As I’m in Europe I use my apps in Metric mode; those in the US can easily switch the app to US mode if they still prefer pounds, inches etc. Of course, it’s not too sensible to have the nip and the web acting in the same direction as gravity. The app makes it very easy to set up more realistic wrap situations simply by changing the angle settings of nip and web. The little diagram automatically adjusts so you can be sure that the angles you set represent the situation on your line. The web is in blue, the nip in magenta and the direction of the resulting load (including the weight of the roller) is shown in red. You can change between three classes of roller material: Steel, Aluminum and Composite and can also choose between “dead” and “live” shafts. One of the first requests we got when the app went on-line was to add the option to calculate the bending of a cantilever roller. As with most of AbbottApps the problem isn’t one of knowing how to calculate but knowing what to calculate. We’d thought that the cantilever wasn’t of much interest so hadn’t included it in the original version. Please feel free to ask for additional functionality for this and other apps.